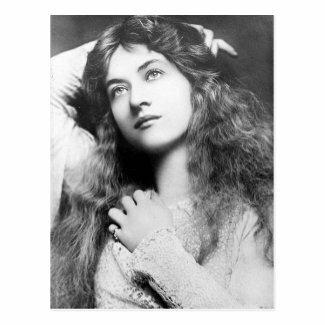 The American actress Maude Fealy was an exquisite beauty whose career encompassed everything from stage performances in the US, Canada and Britain, as well as silent movies and talking pictures. She was born in 1883 in Tennessee and died in Los Angeles in 1971. Her mother, Margaret, was an actress and drama teacher so it comes as no surprise to learn that Maude made her stage debut at the age of three in her mother’s production of Faust. She married an English drama critic in 1907, Louis Sherwin, who wrote for a newspaper in Denver. Her parents were not fans of their daughter’s husband and did everything they could to ruin the marriage; the result was successful and the pair divorced in 1909. Her second marriage to actor James Durkin sparked the formation of a travelling theatre troupe called the Fealy-Durkin Stock Company. This marriage did not last the course and in 1920 she wed John Cort Jr but this marriage was annulled in 1923. She continued to divide her time between stage and screen. Her work in Hollywood was helped immeasurably by her friendship with Cecil B DeMille with whom she had appeared on stage. She appeared in almost every one of DeMille’s films, among them The Buccaneer  and The Ten Commandments . Returning to Denver in the 1940s, she founded a drama school, later going back to Hollywood to do the same. It is a measure of her friendship with DeMille, who died in 1959, that it was he who left money in his will to pay her funeral expenses when she died in 1971. — Adapted from the mini-biography on IMDb. See my other film and theatre-related products here. Only way to get thru life is by keeping a happy heart and laughing.. I have to tell you my daughter Michele’s cancer came back..was in remission for 4 months..thats why I haven’t been around much.. so terrible Sarah..hugs.. I love this kind of thing and am addicted to Wikipedia where you can get a sense of lives like these in a few minutes. It’s a bit sad that she didn’t have any children although no one can say she didn’t have a full and colourful life. Don’t worry, Eric – I can be as shallow as they come and she really is extraordinarily beautiful! I don’t recall having read about her either. Such a beautiful postcard and an interesting woman. As Kris says below, it’s a marvellous combination – brains and beauty. Was not familiar with her. Great post. Brains and beauty. Wonderful combination.